Just a quick reminder to let you know that the Digital CCTV Remote Access Course starts on this Saturday 28th October at 10.00 am. The 3 day course starting on Saturday 28th October is a follow on from Hi-Tech Training’s CCTV Installation Course and explores more advanced applications on integrating CCTV with computers, IP and modern communications technologies. The course (often referred to as CCTV over IP) give installers the skills to access and control pictures, recording and cameras including PTZ from remote locations (where ever an Internet connection is available. This technology is very much in demand by customers at present. Course Content includes integrating Analogue with Digital technologies, Setting up IP cameras, Access and control CCTV from remote locations. 	Understand the fundamental elements that make up a Digital CCTV System. 	Understand how to integrate Analogue with Digital technologies. 	Set up IP, wireless and Covert cameras. 	Configure an IP controlled telemetry systems. 	Access and control CCTV from remote locations. 	Set-up an IP/Network solution for CCTV. 	Set-up and programme digital recording devices. 	Digital CCTV Systems: – Introduction and uses. Core elements of a system. 	Telemetry systems: – IP Controlled Pan, Tilt and Zoom controls, setting up presets. 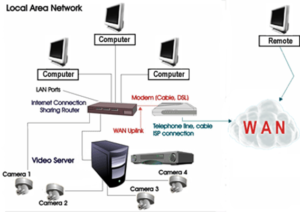 	Accessing images from remote locations: – CCTV monitoring and control over LAN/ WAN/ Internet. 	Transmission of video signals: – Cable and IP. 	IP Technology, LAN, WAN and network principles. 	Integrating CCTV with existing Computer network. 	Setting up IP/Network solutions. 	IP Video Encoders, Video Compression techniques. 	Recording technology: – DVR’s, Network Video Recorders (NVR), Setting up and Programming recording devices. 	Keeping up with latest industry developments.